Welcome back for the main course of this month’s Cooking with Astrology “Leo”. 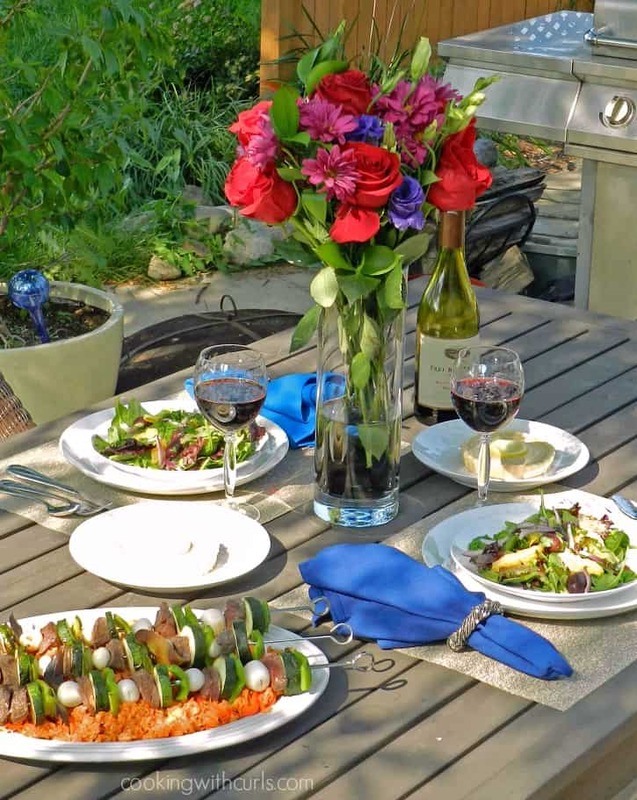 I went with Marinated Lamb and Vegetable Kabobs for this fire-grilled meal for our Leo date. Feel free to substitute beef or chicken, it will taste just as wonderful as the lamb! I grew up eating lamb, so it never even occurred to me that some people do not like it…..or have never tried it! It does have a unique flavor that may not suit everyone’s tastes. Either way, this is what your dinner will look like….. 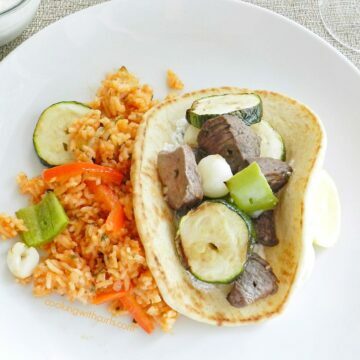 I served the lamb wrapped in heated pita bread, with Tzatziki and Tomato Pilaf on the side…Delicious!! In a large container, whisk together the lemon juice, oil, garlic, oregano or mint, salt, and pepper. Trim the lamb (or beef) and cut into 1 1/2″ cubes. Add to the marinade. 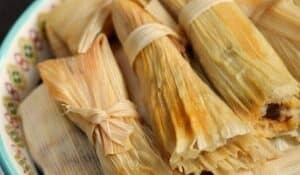 Cover and refrigerate for 8 hours or overnight. Stir occasionally to coat the lamb (or beef). Core, seed, and cut the green peppers into 1 1/4″ cubes. Cut the zucchini into 1″ pieces. Thread the lamb (or beef), bell peppers, zucchini, onions, and bay leaves onto 8 metal skewers. Alternate the ingredients as evenly as possible. Place on a heated grill and cook for 25 – 30 minutes, turning every 5 minutes for even cooking. Serve hot, garnished with lemon wedges, with a bowl of Tzatziki. 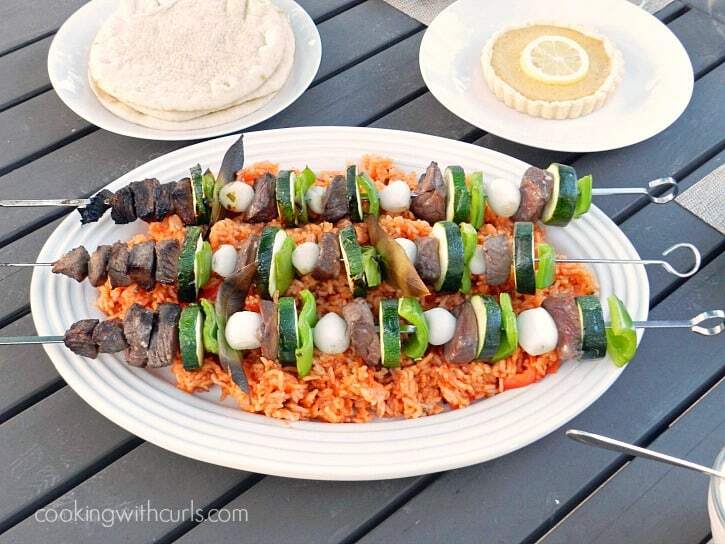 Place skewered kabobs on a greased broiler pan. Place under broiler, and cook for 10 – 15 minutes, turning frequently until cooked. This is not the marinade that I grew up with. This recipe came straight out of a Greek Cookbook, and does not contain wine or rosemary. I think at some point in the future, I will add the other recipe to the collection. Don’t get me wrong, this lamb was delicious…but it was a very subtle marinade. We have all heard about the Mediterranean Diet being heart healthy. Well, this meal is no exception. Zucchini, tomatoes, and peppers are all good for us. Even the lamb is low in fat! Since I was not actually preparing this meal for a Leo, I did not worry about serving a deep, rich Cabernet wine. I went with my favorite Pinot Noir! It’s still red, so that works…right? 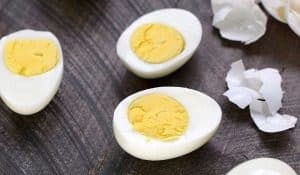 I will be back to add the Tzatziki recipe…as well as the recipes for the Tomato Pilaf, Honey and Lemon Tarts, and Papaya Parfaits later in the week. 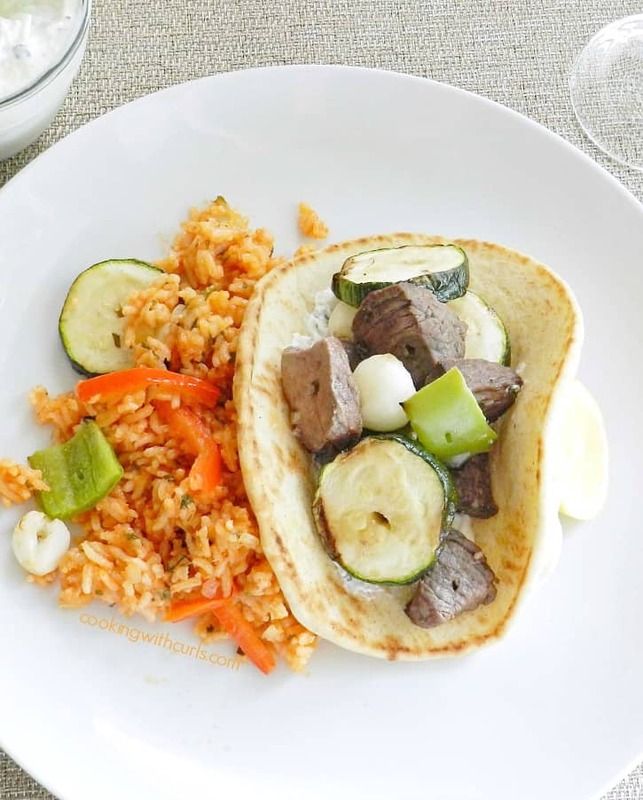 Greek marinated Lamb and Vegetable Kabobs, grilled to perfection with green peppers, zucchini, and pearl onions...served in heated pita with Tzatziki! My kind of meal Lisa! I really cannot resist lamb in any form! These kabobs are spot on! And that pilaf?? The perfect side dish! Lamb is one of my favorite meats. This is a wonderful summer meal Lisa, and I´ll be waiting for the other recipes, especially the tzatziki! I love lamb, and kebabs! Being part Greek, that may be why? Sounds delicious! Your photos are wonderful–I really like the “welcome, come on in and have a seat, I poured you a glass of wine” feel of the big one! This recipe looks yummy, and I’m delighted to follow you on Tasty Tuesdays! Oh, these look so good! Perfect for a summer cook-out! Ohh! I love lamb, this sounds delicious! Definitely pinning and going to try this and add the rosemary you suggested. YUM! 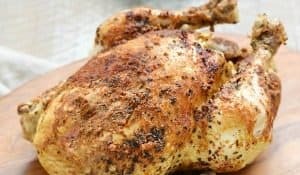 I would probably try this with chicken – we eat a lot of chicken at our house!! Food on a stick is a win for my kids 🙂 Thanks for linking up to All My Bloggy Friends – I can’t wait to see what you share this week!